Koi ponds are ponds that have... well... koi! Koi are an ornamental domesticated carp or in the original Japanese nishikigoi. They are raised and kept in decorated "koi ponds" or water gardens. So you're thinking of putting a koi pond or water garden on your property? A koi pond or water garden can transform your yard into a beautiful spot to unwind, relax, and enjoy. 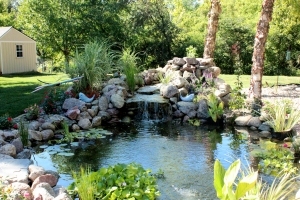 A koi pond or water garden becomes the center point of any outdoor living space for the pond and waterscape enthusiast. Many people only think of their outdoor living space in terms of a patio or outdoor kitchen. But what do you do once the food is gone and there is nothing else to do? Putting a water garden in your yard stocked with koi or other types of fish can be enjoyed for hours. A koi pond or water garden has many different parts that must be coordinated and put together correctly to be successful. The team at Beemer Landscaping has been designing and constructing koi ponds and water gardens for over ten years and has just the right plan for your yard whether it is large or small. If you are in the Des Moines area, we can design and build a koi pond or water garden to suit your lifestyle and budget. We service the entire Central Iowa area so contact us for a free quote or fill out our Landscaping Project Questionnaire.